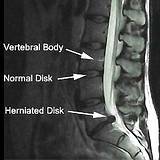 In the condition known as a herniated disk, or herniated disc, the jellylike core of the intervertebral disk bulges outward and presses on the root of the spinal nerve. Fortunately, the effects of aging and the potential for herniated disks can be offset by exercises and natural remedies that strengthen the back muscles and increase flexibility. Intervertebral disks are elastic pads a few millimeters thick that lay between the individual vertebrae of the spinal column. Consisting of a soft, jellylike core and a fibrous ring, they make movement of the spine possible and absorb shock. When the tissue begins to age, usually when people are in their thirties and forties, the disks begin to lose water and elasticity and, therefore, some of their ability to absorb shock. Under the pressure of body weight, the disks can rupture, or herniate. Parts of the soft core bulge outward through the fibrous ring and press on the root of the spinal nerve. 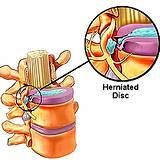 These are herniated, or slipped disks. Back pain, shooting pains in the legs, numbness in the extremities and loss of mobility can result and these are sure symptoms of a herniated disk; a physician must be consulted. 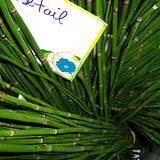 Common Horsetail Nourishes Tissue: Horsetail is beneficial for skin and fingernail problems, broken bones, tendon and ligament injuries and spinal traumas. This is because it is high in minerals, particularly silica, which improves calcium uptake. For a decoction: simmer ½ ounce of dried or 1 ounce of fresh herb in 3 cups of cold water until reduced to 2 cups. Strain and drink a small cup 2-4 times each day. What you can do for a Herniated Disk: Avoid lifting or carrying unbalanced loads. Pay attention to your weight and physical fitness. Being overweight places an additional burden on the disks. A slight bulge in the disk tissue can be induced to slip back into place by relaxation and loosening up by the muscles. Hot bath, massage and back exercises also help. In case of numbness in the back or legs, consult a doctor immediately. 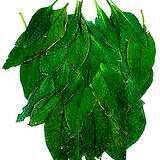 Bath with Comfrey Leaves: Take a relaxing bath with comfrey leaves. Put 1 pound of fresh or 6 ounces of dried leaves into a 5 quarts of cold water for 12 hours; heat, strain and add to your bathwater. 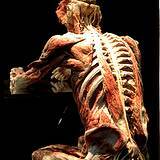 Loosen up the Musculature: For back discomfort or muscle strain, assume the "step-bed" position several times a day. Lie on the floor, bend your knees, raise them and place your lower legs on a chair, footstool, ball or even a stack of pillows. Rest in this position for 20 to 30 minutes. Your Mattress Matters: Besides faulty posture and bad lifting habits, a mattress that is too old is often the cause of disk problems. An ideal mattress should yield at the hips and shoulders, where the pressure is greatest yet support the waist and legs. An old worn-out mattress that has lost its ability to support your body places an uneven load on the spinal column. Experts recommend a lifetime of no more than 10 years for a mattress. You can also try placing a board between the box spring and mattress to increase firmness. Acupressure for hernitated disk: Acupressure is a gentle technique that you can do yourself to ease pressure on your disks. Make a fist with both your hands. Place your knuckles on the left and right sides of your spine at waist level, 2 to 4 finger widths apart, with your palms facing outward. Breathing deeply and evenly, rub this area with your knuckles until it feels warm. Repeat this exercise several times a day. Bad posture can put considerable pressure on your disks. If you spend a lot of time sitting, keep your upper body erect. Don't arch your back, and don't round your shoulders or hunch over. Try to do the flowing exercise regularly to reduce the risk of disk damage, strengthen your back and improve your posture. While sitting, place your feet flat on the floor, hip distance apart. Stretch your arms over your head then bend them with both elbows pointing outward. Fold your hands behind your head. Turn your upper body gently, to the right then to the left. Lean back and breathe evenly. Move your chair back slightly from a table and sit on the edge of your chair. With your arms bent, brace both palms against the edge of the table. Push against the table while pulling your shoulders downward; extend your back. Sit on the front edge of a chair. Stretch one leg forward far enough so that only your heel touches the floor. Extending your back, lean your upper body forward over your thighs. Hold this position for 1 minute; repeat with the other leg. While sitting, bend far enough forward for your chest to touch your thighs, and let your arms dangle at your sides. Note: If you don have disk damage, a support corset can bring relief by immobilizing and supporting your lumbar region. However, don't wear a corset for a long period, as this can weaken the back muscles.